As an act of opposition to the Durban III Conference scheduled this September 21 in New York City, as well as the impending UN General Assembly vote on the Palestinian proposal to seek a “Unilateral Declaration of Independence,” the Center for Security Policy Press has released the inaugural publication of its new archival series: a reprint of Arab Theologians on Jews and Israel (Fourth Edition), by David G. Littman. The publication commemorates the fortieth anniversary of the book’s original publication in September 1971, and is based on the Third 1976 edition. Arab Theologians on Jews and Israel was originally published in 1971 by “D.F. Green” and has enjoyed three previous printings in English, two in French and one in German, and a circulation of over 80,000 to date. With the 2011 reprint of the Fourth Edition of this book, it is revealed officially in the preface that “D.F. Green” was, in fact, the pseudonym of historian David G. Littman and his co-author Professor Yehoshafat Harkabi of the Hebrew University. The book contains excerpts from speeches given at the Fourth Conference of the Academy of Islamic Research in 1968, which was convened in Cairo to discuss the fundamentals of the Middle East conflict, a year after the Six-Day War between Israel and her neighbors, which resulted in a decisive Israeli victory. In addition to excerpts from speeches by high officials, excerpts from eighteen papers presented at the conference are included, as well as the recommendations and names of participants. At the end, there are additional extracts from revealing statements by Anwar El Sadat in 1953, 1972 and 1975 and from Anis Mansour (1972–1975). The organization that held the conference excerpted in Arab Theologians on Jews and Israel, the Academy of Islamic Research, was founded and linked with Cairo’s Al-Azhar University fifty years ago in 1961. The Arab Theologians on Jews and Israel excerpts from the 1968 conference include virulently antisemitic and anti-Israel speeches by mainstream Islamist leaders such as Hussain Al-Shafe’i, Vice President of the U.A.R. (Egypt); Sheikh Hassan Ma’moun, Rector of Al-Azhar University; Dr. Abdul-Halim Mahmoud, Secretary-General (1970) of the Academy of Islamic Research; Dr. Mahmoud Hubballah, Secretary-General (1968) of the Academy of Islamic Research; and Sheikh Hassan Khalid, Mufti of the Lebanon. The September 21, 2011 Durban III conference will be boycotted by the US, Canada, Israel, the Czech Republic, Italy, the Netherlands and Australia because it is expected once again to promote racism, antisemitism and the denial of Israel’s right to exist. David Littman is a British historian and widely venerated human rights activist who has represented several NGOs at the United Nations in Geneva. As a young man, Littman was at the center of a 1961 clandestine operation (codenamed “Operation Mural” by the Mossad) which succeeded in bringing 530 Jewish children from Morocco to Israel, via holidays in Switzerland, when Jews could not leave the country at the insistence of Gamal Abdal Nasser and the Arab League. From 1986 onward, he has appeared at the United Nations representing a variety of NGOs, including the World Union for Progressive Judaism (WUPJ), Association of World Citizens (AWC), World Federalist Movement (WFM) and the Association for World Education (AWE) – to press for justice on many subjects: Soviet Refuseniks, Christian slaves in the Sudan, women and minorities under Shariah law, particularly on taboo subjects such as female genital mutilation, honor killings and forced 9-year old girl marriages in Iran and other OIC countries. He is married to the noted historian Bat Ye’or, author of groundbreaking books on Jews and Christians under Islam, Dhimmitude and Eurabia, with her latest work Europe, Globalization, and the Coming of the Universal Caliphate (2011). His other writings can be found online at www.dhimmitude.org and http://www.iheu.org/. 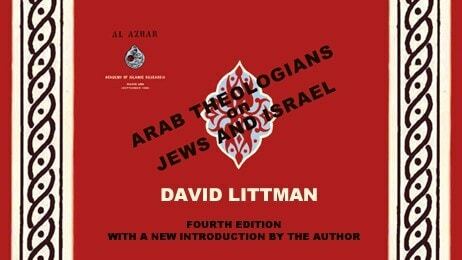 Arab Theologians on Jews and Israel (Fourth Edition) is available for purchase at Amazon.com, and can also be downloaded as a free pdf, Arab Theologians on Jews and Israel, 4th Edition (PDF, 18MB), in the edition prepared by online publisher Brian of London.